- Email submission will not be acceptable after December 31, 2017. - The manuscript files MUST be in Word format (.doc or .docx file), with double spacing and line numbering. It is preferred to include all texts, tables, illustrations and supplementary files in one file when submitted for consideration. Separate files containing illustrations of large size are acceptable. If your submission is larger than 20M, please contact our editorial office for submission. - Please confirm that your manuscript is in compliant to the requirements given in the Instructions for Authors. - JEI will send you an acknowledgement message once your submission has been received. This message will include an identification number assigned to your manuscript. Please make note of this number for your records. All future correspondence with JEI regarding your submission will be based on this identification number. - For submissions before March 10th, 2017, the authors should contact JEI Editorial Office at jei@iseis.org if you need to check the status of submission. 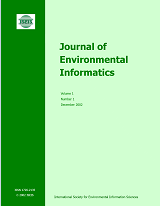 Already have a Username/Password for JOURNAL OF ENVIRONMENTAL INFORMATICS? Registration and login are required to submit manuscripts online and to check the submission status.